Home / Blog / The Book of Will The Book of Will Kate Hurster as bar maid and daughter Alice Heminges with Shakespeare associates David Kelly as Henry Condell, Keven Kenerly as Richard Burbage, Jeffrey King as John Heminges. Photo by Jenny Graham. William Shakespeare may be the world’s most revered and recognized figure in literature. Remarkably, we know little about him personally; he lived a long time ago but has not been superceded; and but for the diligence of two colleagues, we would not have a virtually complete and authenticated canon of his work. Lauren Gunderson’s The Book of Will tells with comedic embellishment the true story of the publishing of Mr. William Shakespeare’s Comedies, Histories, & Tragedies, commonly known as the First Folio. 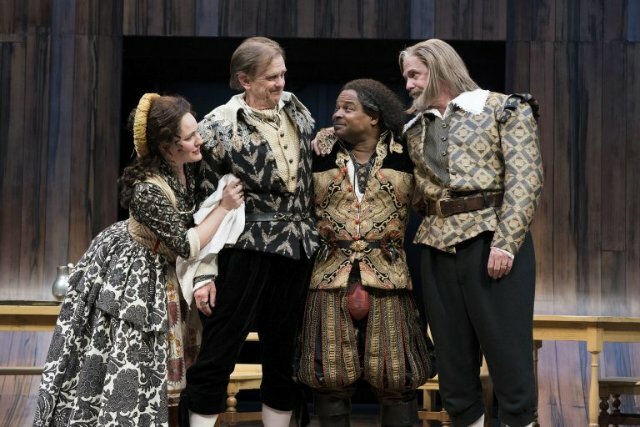 Oregon Shakespeare Festival gives a fine rendering of the amusing play, appropriately at its outdoor Allen Elizabethan Theatre venue. The contemporary interest in building a life’s scaffolding around the Bard’s vague existence seems rather odd. In addition to the present consideration, Tom Stoppard wrote Shakespeare in Love, a fiction about an affair of Will’s as the basis for Romeo and Juliet, while Vern Thiessen wrote Shakespeare’s Will, a retrospective of the playwright’s marital history delivered by Anne Hathaway on the day of his funeral. The movie Anonymous explores the theory that Shakespeare was a front, probably for Edward de Vere, the 17th Earl of Oxford. Although there should be no reason for people in the 21st century to have a vested interest in who actually wrote these masterpieces, slews have taken to defend “their” Shakespeare. Perhaps they don’t wish to see the contributions of a man from a common background displaced by some effete, parvenu noble. Gunderson is well known to Bay Area theater goers. The most produced playwright in the country in 2017-2018, she has been playwright-in-residence at Marin Theatre Company, and twice won the American Theatre Critics Association Steinberg Award for best new play, once for The Book of Will. Gunderson clearly knows her Shakespeare, as she litters her work with inside jokes based on his plays that will please Shakespeare lovers. The first act is bright and funny throughout with pauses for grief. The second opens with a lengthy death and grieving sequence that takes the wind out of the comedy. Fortunately, action and humor pick up again, but maybe without quite the same intensity and consistency as in Act 1. Richard Burbage, likely the most famous Shakespearian actor of Elizabethan time, dies early in Act 1. Kevin Kenerly is so thrilling as Burbage that you pray that he will come back as a ghost or in the imaginations of Henry Condell and John Heminges, the associates who compiled the folio. In fact, the playwright creates a false expectation with the emphasis on the fact that it was Burbage who virtually memorized all of the legitimate texts. This was noteworthy as many false scripts were in circulation. But instead of actors trying to reconstruct language of some of the plays, which might have been fun to see, the detectiving is on finding genuine copies of the plays. Incidentally, Kenerly does return in another compelling role – the blind William Jaggard, a publisher who had crossed paths with Shakespeare many times and was held in disrepute. The remaining historical personage key to the story is Sheakespeare’s competitor, Ben Jonson, played in a cantankerous fashion by Daniel T. Parker. Along the way, we meet an additional host of distinctive characters, particularly the families of the main characters. In fact, the disparate goals of the compilers and their wives represent important thematic elements of the play. Assembling correct copies of the manuscripts would be an expensive and lengthy process with no guarantee of success, and the conflicts and resolutions among the principals add poignancy the proceedings. Thematic implications include – is this the right thing to do? Is the fact that Will would have wanted it sufficient? Is it worth the sacrifice of distracting one from his livelihood? What about the lost time with family? But ultimately, what about the standing of art in history? Would we fail future societies by losing the rich cultural heritage that a folio would provide? The other critical theme of play is comedy itself. As Gunderson notes, laughter is a potent physiological force that facilitates health and happiness. And at a social level, it makes strangers less strange. Strangers or even adversaries may build bonds over shared laughter. The Book of Will by Lauren Gunderson is produced by Oregon Shakespeare Festival and plays at its Allen Elizabethan Theatre in Ashland, Oregon through October 13, 2018. Posted from For All Events.